The following summary captures the discussion at the recent Conversation hosted by The Museum Group (TMG) during the American Alliance of Museums conference held in Atlanta. This post was jointly prepared by Carol Bossert, Paul Orselli and Barbara Punt to appear on their respective blogs. A briefer summary will appear on the TMG web site. The Museum Group, a collective of independent museum professionals, has a history of bringing together small groups of people at conventions such as the American Alliance of Museums, to talk about topics important to the museum field. Carol Bossert, a member of TMG and host of Museum Life proposed a discussion about the RFP process, a process used extensively over the past ten years to select almost every type of outside contractor from an exhibit fabricator to master planner and campaign consultant. She was joined by Independent Museum Professionals, Barbara Punt and Paul Orselli, to frame the ongoing conversation. Bring together any group of consultants and specialty providers within the museum industry and the conversation eventually turns to the ways in which this process is poorly implemented from organizations that give respondents less than ten days to respond to the RFP, sometimes over Thanksgiving or New Year’s, to organizations that neglect to notify respondents after the selection has been made, or require respondents to submit fully developed design solutions and then ask the winning group to use a competitor’s idea. But the greater concern is what the effect this process has on creativity, collegiality and the ultimate products the museum produces. The goal of the TMG conversation was to move beyond whining to clarify the issues and think about solutions. In fact, “no whining” was a stated rule at the outset. Nevertheless, the conversation was lively and thoughtful, and all participants—thirty in all—shared information. The RFP process, whereby a museum issues a request for a proposal from a company or individual to perform a certain task such as designing an exhibition or developing a multi-media program, has a patina of fairness: everyone receives the same information and has the same time frame to present themselves. Boards and donors appreciate a transparent, documented approach to decision-making, especially when large sums of money are involved. Unfortunately, a poorly crafted RFP, one that does not clearly express what the organization is looking for, or a process that is handled badly, can tarnish an institution’s reputation, lead to poor decisions and undercut trust—even from the company that won the job! Be kind. Everyone understands that this process involves competition. A museum makes a selection. There will be a winner and there will be losers. But just because the selection process is competitive, does not mean that it should be stripped of civility and the niceties of human discourse. This means that the museum needs to treat everyone involved with respect: answer questions, keep to the stated deadlines for making decisions, and keep individual responses confidential. At best, contact the firms that did not win the competition and tell them why. Many RFPs provide a point system for selection. There is no reason why the scoring cannot be shared with all respondents. Also, appreciate the time it takes for a company or individual to put together their response. Do your homework. While there are no current standards for soliciting and managing RFPs for the museum industry as there are for architects, engineers and construction contractors, there are some good resources. 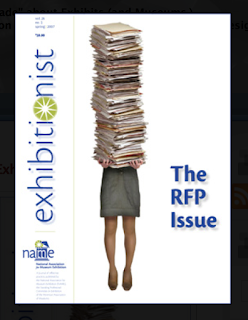 The National Association for Museum Exhibitions (NAME) devoted an entire issue of the Exhibitionist, entitled “The RFP Process,” published in Spring 2007. http://name-aam.org/resources/exhibitionist/back-issues-and-online-archive. (The articles from the issue are available for free online along with templates relevant to the RFP process.) Talk to other museums and organizations whose work you admire. Get recommendations. Limit the number of companies or individuals you solicit. The broader the solicitation, the less likely the museum will receive useful responses which respond to their particular needs. Know how to evaluate the proposals. Slick proposals and jazzy power points are nice, but which firm knows what to do when the budget starts to creep up or the timeline expands? What happens when there are bumps in the road? Will you trust that group over the long haul? Will you enjoy being with that individual or team for long periods of time? If the museum says that it is looking for a creative team, then how will they know when they see one? What is the criteria for creative? Reconsider the RFP process as the only way to select the individual or company. The museum business is a people business. It is a creative business. The RFP process does not reflect this. Do not use the RFP process to solidify thinking. If you don’t know what you want—and many clients don’t, especially at the beginning of a project—the RFP process will not clarify it for you. Spend your time talking with people: other museums, companies and individuals whose work you admire. It can be better to hire someone on a limited basis to help you figure out what you want. Know the lingo. There are RFPs, RFQs and bids. They are all different, and they all should have different purposes. Vocabulary says a lot. The word “vendor” automatically creates a divide between the museum and its consultants and specialty provider. We are as committed to museum best practice as museums staff and board members. We attend conferences, read articles and work hard to improve our practice. Many of us have worked in museums. We have areas of expertise that compliment and augment the museum’s resources. It takes both of us. We are partners, not vendors. Similarly, calling RFPs contracts and[P1] /or throwing in a lot of punitive contract language creates an adversarial relationship from the start that is bound to end badly. So how can we address these issues? Standards. The museum industry seems to be the only industry without industrial standards and code of ethics that covers the solicitation and selection process. As more museums look to outside companies and individuals for specialized expertise, there is greater need for standards. Data. We need to analyze good projects and find out what made them successful, not just on opening day, but beyond. We tend to focus on the horror stories, but what about the projects where despite the inevitable bumps in the road, the team worked well together and was proud of the product? Communication. We need to have more conversations among museums and providers. We need to work toward partnership. Feel free to contact any of the folks below to follow up on this discussion. We manage projects of all sizes to ensure they are completed on time and on budget. Our holistic and proactive approach takes into account the totality of your vision, not just elements of architecture or construction. Contact Barbara at Barbara@puntconsulting.com or call her at (310) 937-3366. We help organizations think through, shape and document the ideas and stories that form the foundation for remarkable exhibitions. We bring a systematic and deliberate approach to content research, development and label writing. Contact Carol at carol.bossert@verizon.net or call her at (301) 208-0303. And you can always contact POW! and Paul Orselli at info@orselli.net or (516) 238-2797.